The 12U Dragons won a silver medal this past weekend at the 13U Bugarski Cup in Cornwall. The team received some sad news leading up to the tournament causing them to play without one of their energetic leaders who lost her father to cancer earlier in the week. The girls rallied around their teammate and supported her and the family by wearing white ribbons to support lung cancer. Our thoughts & prayers are with them and hope to see her on the court soon. The Dragons finished first after going undefeated in their pool earning a bye to the semi-finals where they faced a familiar opponent Team Evolution. Losing the first game21-25 , they were able to pull it out with a win, 25-18 & a thrilling 16-14 deciding game. The final game saw the Dragons face an unbeaten Maverick team. They played well but came up short with scores 16-25 & 24-26 earning the SILVER MEDAL. They now have a Bronze & Silver at 13U tournaments and also earned another Silver at the 12U event in Barrie a few weeks ago. 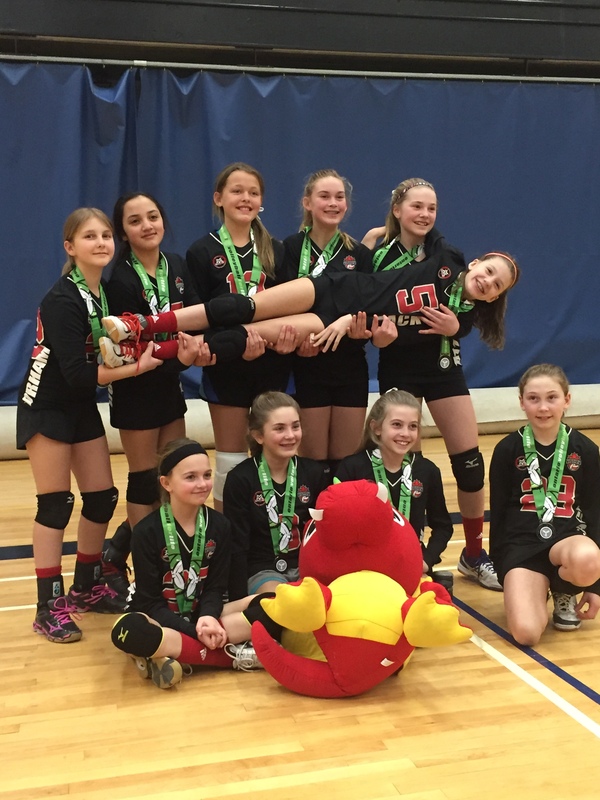 They have their sights set on winning GOLD in a few weeks at the Provincials…….GO DRAGONS!!! !